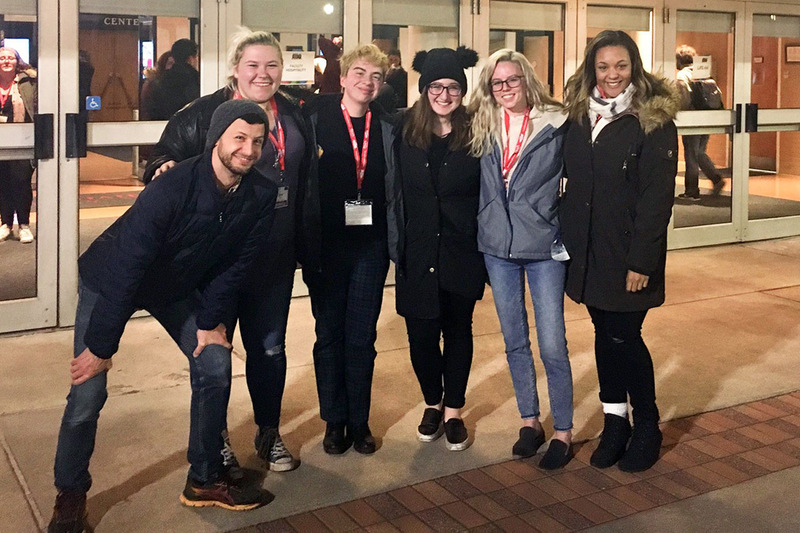 Victoria Covell, Jamie Froio and Kimmie Sandberg traveled to Montclair State University to attend the KCACTF conference. From left: Andy Head; Jamie Froio; Kyle Buohl, a third-year ASL-English interpretation major; Kimmie Sandberg; Victoria Covell and Gaby Robinson, a fourth-year ASL-English interpretation major. Victoria Covell, Jamie Froio and Kimmie Sandberg were all part of RIT’s production of Cabaret from Nov. 30 to Dec. 2, 2018. Covell, a third-year graphic design student from Jacksonville, Ill., has always been a dancer, but wasn’t involved in theater until this production where she played the lead role of Sally Bowles. Unlike Covell, Froio, a second-year theater arts student from Hull, Mass., has been involved with theater since she was 4 years old and has been involved with 20 productions, including her role as Fraulein Schneider in Cabaret. Sandberg, a third-year new media marketing student from New Milford, Conn., has been involved with theater since her freshman year of high school and worked behind the scenes as the stage manager for the production. Due to their exceptional performances, Covell, Froio and Sandberg were nominated to attend the Kennedy Center American College Theater Regional Festival (KCACTF) from Jan. 15-19 at Montclair State University in Montclair, N.J. KCACTF is a national organization that promotes all aspects of collegiate theater across the country, including acting, dance, directing, stage management and more. To qualify, schools enter their productions into the festival and faculty from other universities attend the performances, give feedback and nominate students to attend the regional festival. At the festival, Covell, Froio and Sandberg represented RIT in the Irene Ryan Acting Scholarship, the Musical Theater Intensive Scholarship and the Stage Management Fellowship Program competitions. Covell and Froio emphasized their appreciation for Andy Head, visiting assistant professor of performing arts and visual culture at both RIT and NTID, and interpreters Catherine Kiwitt and Cynthia Collward. Head, Kiwitt and Collward worked with them during the original performance of Cabaret, and traveled with the group to the KCACTF festival in Montclair, N.J.
For more information about the upcoming productions for the 2019-2020 College of Liberal Arts and NTID Performing Arts theatrical season, go to https://www.ntid.rit.edu/theater/announcements/2019-2020-theatrical-season. Question: Why did you get involved with theater and the performing arts program on campus? Answer (Covell): I’ve been dancing for about 18 years and I am always trying to find opportunities to dance, but I never thought about being involved in theater. What happened was, after I won first place for Dr. Munson’s Performing Art Challenge in April 2018, I got an email from professor Andy Head saying that there was an opportunity to dance in a theater production called Cabaret. My mind was set to dance and I was super excited to get involved. After I auditioned, I ended up getting the lead role and sucked into theater life. It was absolutely the best experience of my performing arts career. Question: What is Cabaret about? Answer (Sandberg): Cabaret is a story about an American novelist, Cliff Bradshaw, who travels to Berlin to work on his newest novel. In Berlin, he meets Sally Bowles, a worker at the Kit Kat Klub, and they fall in love. They both get caught up in the nightlife and culture, but, as the story goes on, it starts to get darker and darker as the Nazi party begins taking power in Germany. When it is clear there is no hope left, Cliff decides it is time to leave, thus leaving behind a life and a woman he loved. Question: What was your reaction when you learned you were invited to the KCACTF regional festival? Answer (Froio): I don’t think I’ve ever cried harder in my life. I was so overwhelmed with happiness, I just couldn’t believe it. A lot of the tears were because of how bittersweet the moment was because my grandfather wasn’t around to see it. He was my strongest supporter, but he passed away right before I came back to school in August. Cabaret was my first performance without him. Question: What sort of activities did you do at the festival? Answer (Froio): I went to a bunch of workshops that I was interested in. I got to sing, dance and act every single day. I was selected to perform in a Late Night Cabaret thanks to my Musical Theater Intensive Scholarship audition, which was an absolute blast. I also auditioned for a theater company called the Open Jar Institute, which I was accepted into. So, I will be travelling to New York City for their summer intensive program. Question: You all presented two scenes from Cabaret at the conference. Was it intimidating performing in front of an audience that was experienced and knowledgeable about performing arts? Answer (Covell): It was not intimidating because, surprisingly, we were pretty good for being from a technical university that isn’t specifically a theatrical school. We have a lot of talented students at RIT. I was super proud and it was a privilege to perform our scenes from Cabaret that represented our diverse university of deaf, hard of hearing and hearing students combined. Question: Overall, what was the most rewarding part of this festival experience? Question: Would you recommend that other performing arts students try to get involved with a festival like this? Answer (Covell): Yes, I would highly recommend that students grab opportunities to get involved with a festival like this. It’s not just about acting. If you’re a costume designer, set designer or makeup artist, it’s awesome to get exposure and learn from the best people working in that field. There are amazing resources and networks out there if anyone interested in performing arts wanted to pursue a performing arts career. Question: Are there any new productions coming up that students can get involved in? Answer (Sandberg): Yes. There is one more COLA show this semester, AI-Pollo, NTID has Fences coming up, and the RIT Players are putting on Drowsy Chaperone. There are always ways to get involved with the arts if you are interested, and being involved doesn’t mean you have to be onstage. Shows are always looking help with costumes, props and run crew. Question: Do you think you’ll continue pursuing your love for theater after you graduate? Answer (Sandberg): I really can’t see myself not being involved with theater. When I got to college, I really didn’t think that I was going to continue to do theater, but I didn’t realize how much I would miss it. Right now, my plan is to work on productions for the remainder of my time at RIT. After graduation, once I am settled somewhere, I’ll start to look for a local theater to get involved with. There really is no group like a theater group. I strongly encourage anyone who has even the slightest interest in theater to pursue it. Worst comes to worst, you find out it’s not for you, but more than likely you will find a group of lifelong friends.